Campaigners told TDs this week that they need a review of these conditions in Ireland so they are recognised and so that patients can access proper treatment and supports. PATIENTS SUFFERING FROM illnesses with debilitating symptoms such as chronic pain and fatigue have said they are still fighting to have their conditions recognised. 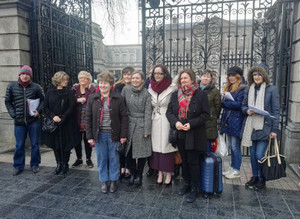 People Before Profit TD Gino Kenny hosted a presentation earlier this week in the Dail with speakers from fibromyalgia and Myalgic Encephalomyelitis (ME). ME is a neurological disorder that affects multiple systems of the body and often follows an acute viral infection. Sufferers experience brain inflammation, headaches, bone and muscle pain, swollen lymph nodes, muscle spasms, seizures, vision abnormalities, bowel dysfunction and cardiovascular abnormalities. There is no official data on prevalence in Ireland, but campaigners estimate there are 12,000 to 14,000 people living with ME in Ireland.